How can a virtual server overcome performance limitations imposed by emulated file-based storage? 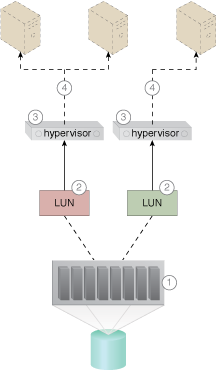 LUNs mapped via a host bus adapter on the hypervisor can restrict data access to emulated file-based storage, which can impose performance limitations. The virtual server is granted direct access to block-based storage LUNs via the physical host bust adapter card. 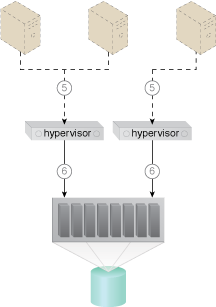 Raw device mapping technology is used to configure the hypervisor to enable access to raw, block-based LUNs to virtual server. A cloud architecture in which virtual servers are given direct access to block-based storage LUNs (Part I). 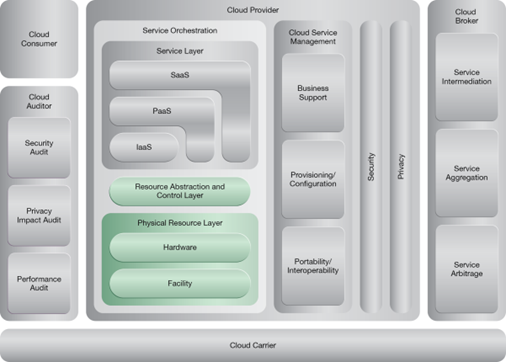 A cloud architecture in which virtual servers are given direct access to block-based storage LUNs (Part II).